Ron Alterovitz is a Professor in the Department of Computer Science at the University of North Carolina at Chapel Hill. 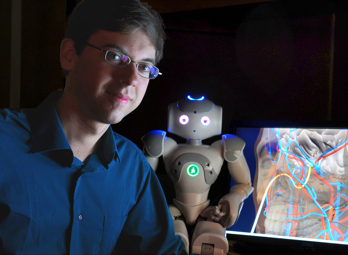 He leads the Computational Robotics Research Group which develops novel algorithms for robots to learn and plan their motions, with a focus on enabling robots to perform new, less invasive medical procedures and to assist people in their homes. Prior to joining UNC-Chapel Hill in 2009, Dr. Alterovitz earned his B.S. with Honors from Caltech, completed his Ph.D. at the University of California, Berkeley, and conducted postdoctoral research at the UCSF Comprehensive Cancer Center and the Robotics & AI group at LAAS-CNRS (National Center for Scientific Research) in Toulouse, France. Dr. Alterovitz has co-authored a book on Motion Planning in Medicine, was co-awarded a patent for a medical device, and has received multiple best paper awards at robotics and computer-assisted medicine conferences. He is the recipient of an NIH Ruth L. Kirschstein National Research Service Award, two UNC Computer Science Department Excellence in Teaching Awards, and an NSF Early Career Development (CAREER) Award. More information is available on the Computational Robotics Research Group site.